The perfect living room will effortlessly welcome you and your family, as well as friends and guests, into a stylish and comforting atmosphere for an enjoyable experience. The Coby living room collection is the living room setting to do just that. 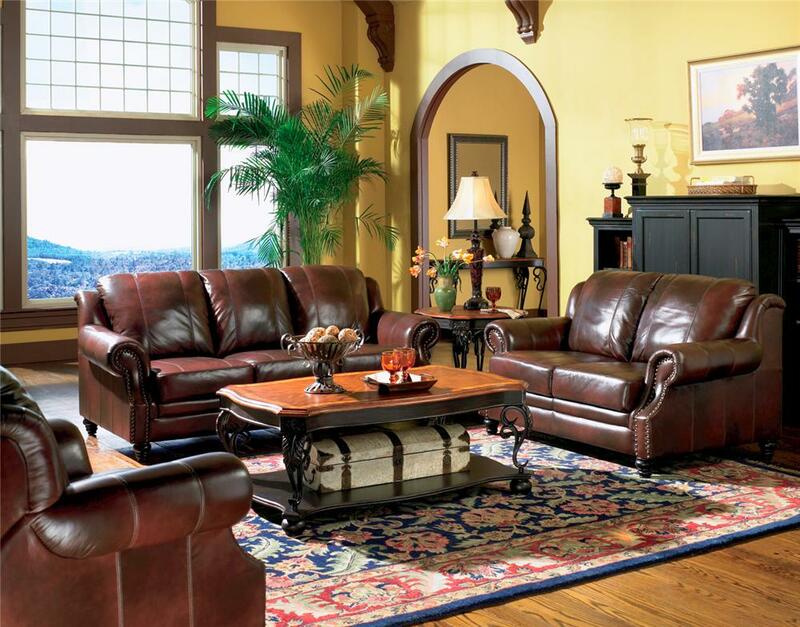 Each piece is covered in rich brown, top grain leather upholstery that is long-lasting, flexible, and relaxing. Rolled arms, seat back, and front bench are outlined and expertly tailored with beautiful nailhead trim for a sophisticated, elegant style. Large, over-stuffed seat cushions bring comfort and support, enhanced by the cushioned ottoman for propping your feet up after a long day. Solid hardwood frame and exposed block wood feet provide durability and long-lasting support that will make this set a part of your home for years to come. Friend, family, and guests are guaranteed to enjoy themselves in your refined and classy living room furnished with the Coby living room collection.